This is my first attempt at blogging on Fiesta Friday – thanks to Selma who very kindly invited me to partake. I’ve just started blogging, so I hope you will forgive any issues that may arise as a first time blogger; I am learning slowly but surely and hope to join in more frequently. I’ve seen so many amazing food blogs on WordPress and am excited at the thought of getting to know you all individually. Thanks and recognition for this recipe goes to a dear friend Susan D. for actually inviting me over to bake these cookies with her a few years ago. I’ve made these a few times over and tend to make them on special occasions. The stars looks pretty festive and striking especially around Christmas with the red jam peeking and oozing through the cut-outs. They are positively melt-in-your-mouth scrumptious! There aren’t too many ingredients, and it is basically a shortbread recipe, but I warn you, it is labor-intensive. I used both star and round cut-outs. The house smells just heavenly when these are baking. 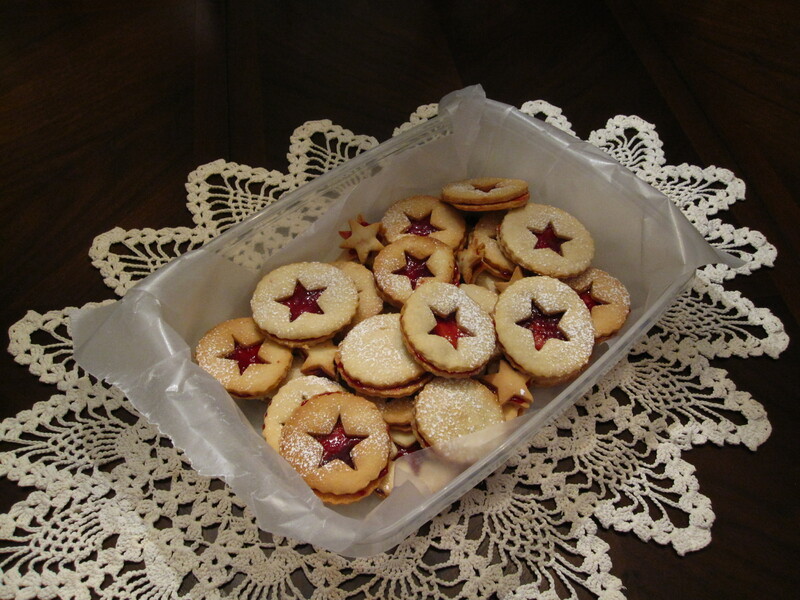 With the little star and round remnants, I sandwich these together with a little jam for miniature cookies. …..And here folks is the finished product – it was my first attempt at making these little beauties, so they were a bit well-done. I lower the temperature a tad now, and they turn out just perfect! Can you find the miniature stars in the galaxy? 🙂 And now for the recipe and my first Fiesta Friday entry. In a mixer, sift sugar, add to butter gradually and cream. Add vanilla and ground almonds. Knead flour by hand or wooden spatula until mixed (this part is probably the toughest and messiest). 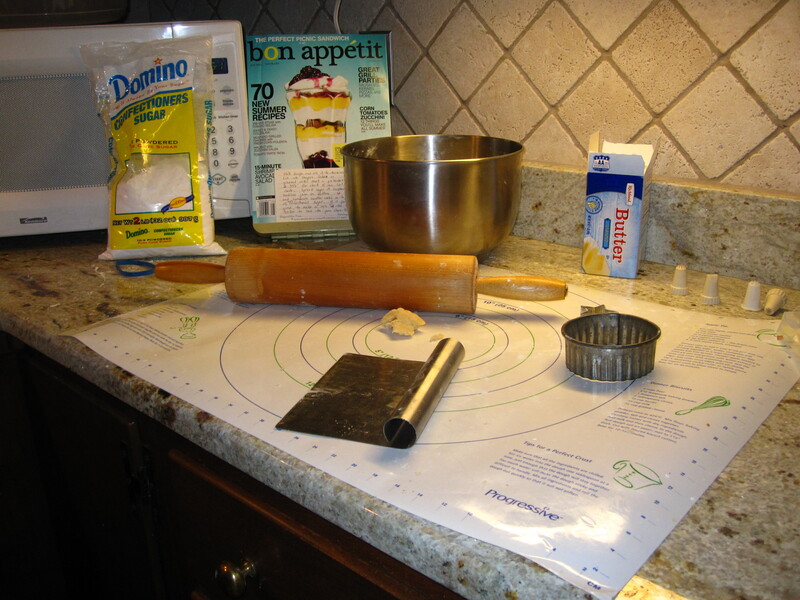 Chill dough and roll it to thickness of 1/8″. Cut into shapes (I used a star cut out and a round cut out, using the round as the base and the star as the top). Bake on cookie sheet with parchment paper in a pre-heated oven @ 350 deg for about 15 minutes (check to make sure as oven times vary). Cool on rack. 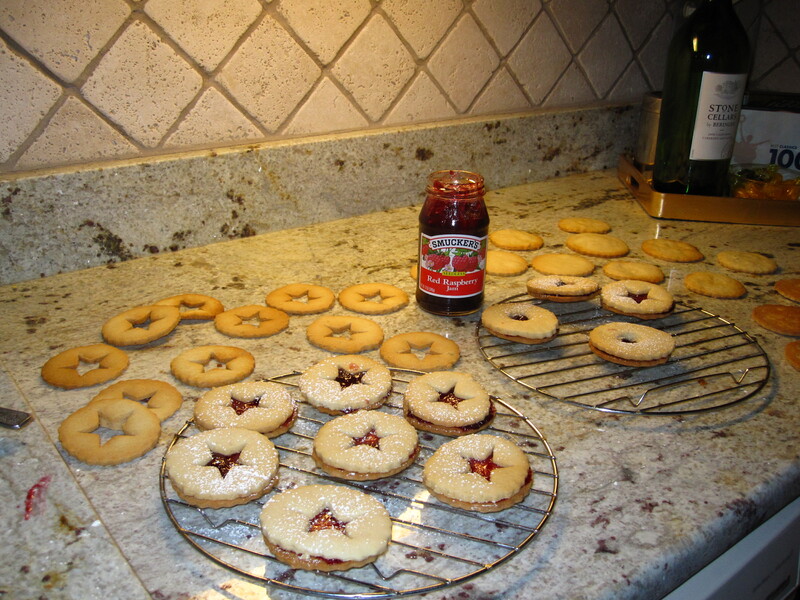 Spread a layer of raspberry seedless jam on bottom and sandwich another cookie on top. Dust with more confectioners sugar. It is particularly striking to make a hole of any kind on top of the cookie to have the jam show through. Mine were stars as I usually bake these around the holidays. Thanks so much Jhuls. This was my first attempt at contributing, I’m already thinking what I might bring next Friday. It is fun, and a great way of mingling and sharing. Thanks for the welcome! Your almond shortbread cookies look so perfect – I can’t wait to see what you will bring next week! I’m going to make a batch of these for when I have guests – I love to have a pot of home made cookies to offer, and if mine turn out this well they will be perfect! Hi Apsara, yes they are very much like Linzer cookies, it seems there’s quite a variation of this little cookie, and once you start eating, you cannot stop 🙂 Thanks for stopping by, would love to try some of yours too. Thanks so much for your kind comments. Yes shortbread cookies are a little finicky, I think I probably perfected mine by trial and error (many errors) :). Would love to follow you too, I am enjoying meeting folks from across the globe today as a result of contributing to FF. Hi Loretta – it has taken me ages to edge my way round to say hello – this party is wall to wall and humming! Thank you so much for joining in the fun – your beautiful biscuits look delicious and terribly festive! They are going to go down a treat with gang! Seeing that jar of Smuckers really took me back to when I was living in Canada! We used to love the blueberry…I hope you have had a chance to check out the other revellers, meet new bloggers and make some new friends – enjoy the party Loretta! Aww, you’re so kind. You are right, everybody is just so warm and welcoming. Is there a way that Word press lets you know if someone has responded to a comment that you’ve posted on their post on FF? I’m having a hard time trying to figure that out. It’s just nice to see a thread, or if it’s like FB, you have a notification that someone has liked or written back. Anyway, you’ve done an awesome job getting this all started and making it all look so simple. It’s a great blog you have and some wonderfully creative ideas. I find myself wondering what I’ll be posting next each day :). Yes, at the top right hand corner of your blog, if you’re logged in, next to your gravatar, there’ll be icons to indicate if you’ve had a comment or reply to your comment, a like, a follow, etc. These are beautiful… I love shortbread cookies, they are the best ! Merci beaucoup Catherine, I see you’re from Quebec? Such a beautiful province in Canada. I used to live in Toronto. Thanks for the warm welcome saucygander :). I like your blog’s name too :). Don’t you just wonder how folks come up with these names? Thanks for your comments. I’m not very patient either, that’s why I only make them around the holidays (, Birthdays, Christmas, Thanksgiving etc.). Loretta, it’s terrific to “meet” you at Fiesta Friday. Your blog looks great and I love your first few posts about your travels and cooking background. I am a big fan of shortbread cookies and these little jam sandwiches and yours look delicious! oh yum those remind me of biscuits i made not long ago i bet you had fun making them? Welcome to FF Loretta! And thank you for bringing these lovely cookies! Thanks Naina, it has been quite an experience and I’m loving it. Thanks Heather, they really are! Previous PostPrevious COOKING UP A STORM! Next PostNext An Indian feast with a Spanish twist!